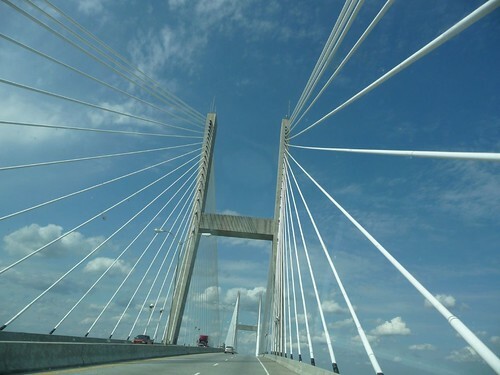 Mali Mish – Day 86: Savannah’s sister city – Charleston, SC. Before we get on the road though, we had to move over to the day use parking lot until the afternoon since I had some work to do that required me to be on the computer and on the phone. Not knowing where exactly we are going and whether or not we will get there in time, we decided to stay here just awhile longer until my work is done. 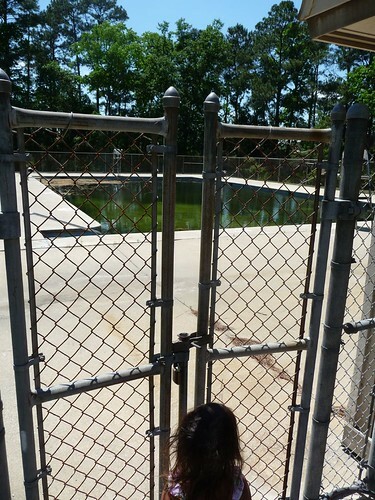 While I was in the Airstream working away, the girls took a walk to check out the swimming pool at Skidaway Island State Park. At least I think it is the pool. Maybe it is the fish pond. Well, I guess the economy hit the Georgia state park systems just as it has many others. 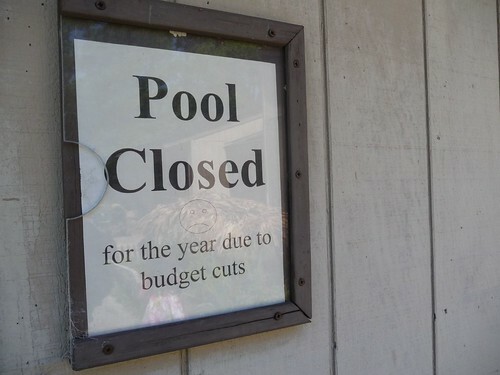 Skidaway had to close the pool this year due to budget cuts. I guess if we look at the bright side, they are better off than Arizona and California who have been planning to shut down most of their parks in its entirety. 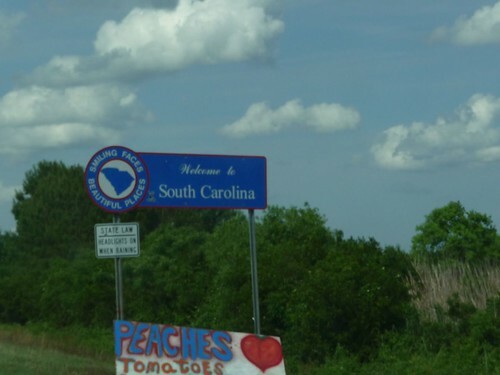 Finally we got on the road again and headed across the bridge and into South Carolina. Savannah is right at the northern Georgia and South Carolina state border. The border is actually in the middle of the Chattooga River that drains from the Great Smoky Mountains and forms the entire border line of the 2 southern states. On the other side of the bridge from Savannah, there isn’t much to see. It pretty much goes from Savannah, Georgia to a two-lane country road in no time flat. Our first destination in South Carolina is Savannah’s sister city, Charleston. Well, not before we got a quick bite of Hardee’s Thickburgers first. Much like Savannah and Charleston who are sister cities, Hardee’s is the sister fast food joint to our west coast counterpart Carl’s Jr that happens to be home based in a little town called Carpinteria just 20 minutes north of us. 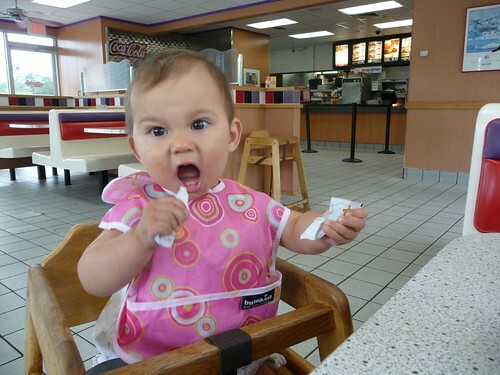 Mila here is determined to get into that ketchup packet with or without our help using her newly commissioned two bottom teeth. A quick search on the Internet found little resources on what the best place is to stay. 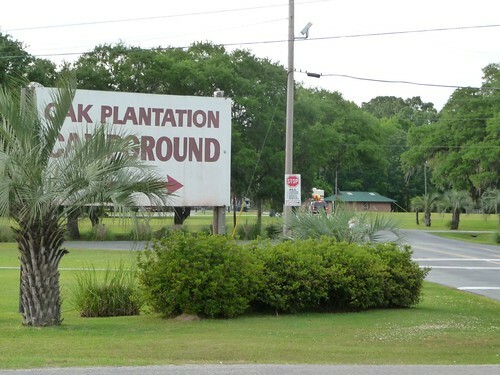 However as we drove towards Charleston, we saw a billboard advertising an RV Park called Oak Plantation Campground. 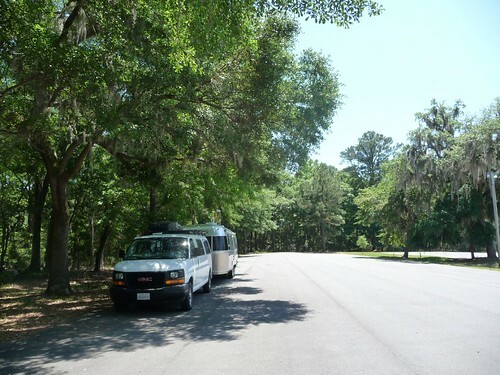 It claimed to be the closest RV park to the city of Charleston. Sure, why not. 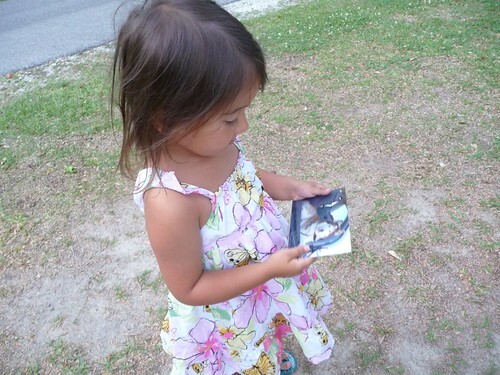 We can buy into a little marketing propaganda. It’s good to know that traditional advertising still works for the Internet addicted travelers like ourselves. 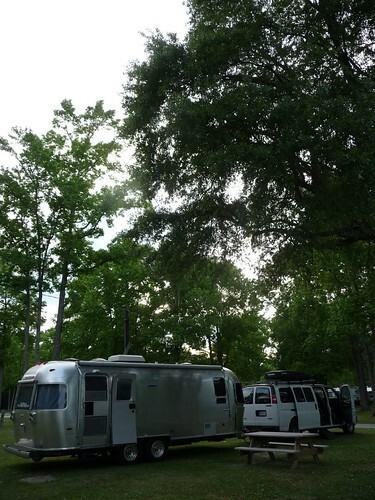 Oak Plantation is a real southern plantation that has been converted to an RV park. Not much of the original plantations remain but a couple of buildings and apparently some of the livestock. About a half dozen cows roam just on the other side of some wired fences that help keep the grass down. 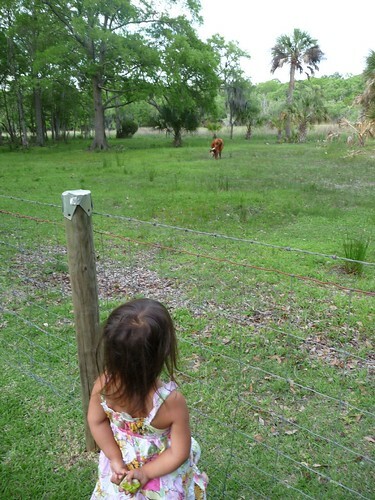 Learn more about specialized fences at https://allcountyfence.com/services/. For a site with water and electricity, we got a site for $23 a night using our Good Sams Club membership. Not too bad especially considering what we had been paying for places in Florida. There are full hookup sites available for a bit more but since we didn’t plan on staying long, we didn’t need sewer. 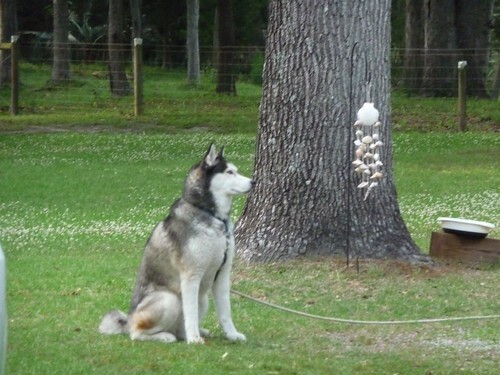 Right next to our assigned site, we saw a beautiful Siberian Husky on a dog run next to a class A RV. 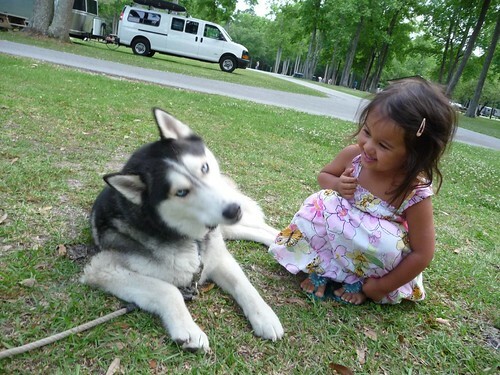 About 2 1/2 years ago, we lost our beloved Siberian Husky of 10 years named Rudy when Ava was exactly 9 months old. A large part of our desire to see the country stemmed directly from that very emotionally traumatic loss of Rudy. We keep a photo of her in the car to remind us that life is precious and we need to enjoy it to the fullest extent while we still can. Even though Ava was an infant, she clearly remembers Rudy and even til this day, you can still find her fluffy white hairs trapped behind our couches and cabinets. His name is Blaze. Blaze loves playing with kids. Ava loves playing with Blaze. I think we might have to spend a couple of nights here.